The Akari 10A Floor Lamp is part of the Akari light sculptures, designed in 1951 by the American Japanese artist and designer Isamu Noguchi. He chose the name ‘akari’ for these objects, a word that means ‘light’ in Japanese, connoting both illumination and physical lightness. 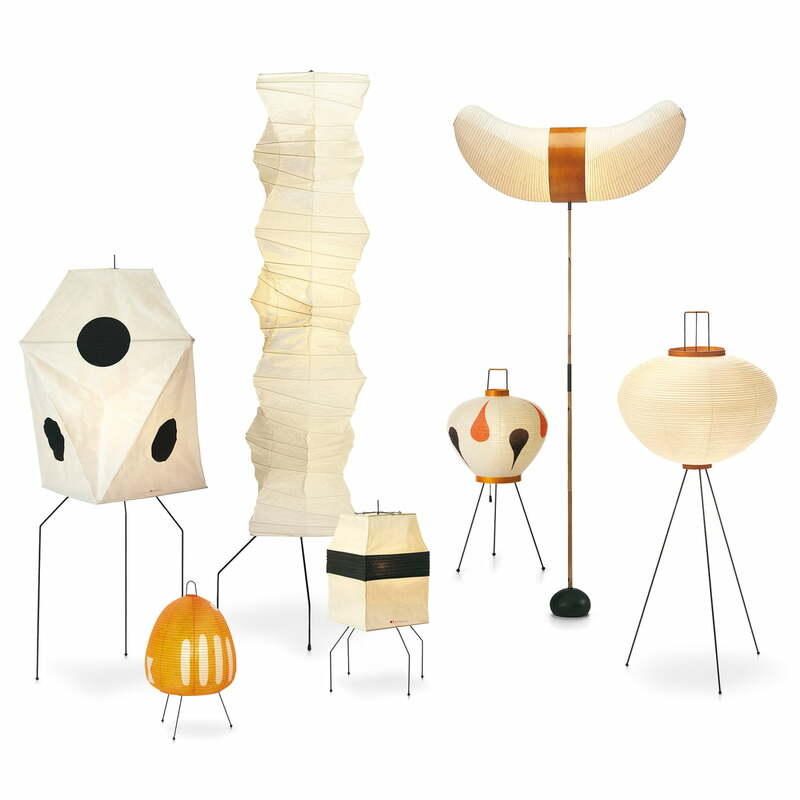 The inspiration for the design of his lights stem from a visit in the Japanese fishing village of Gifu, where Noguchi watched the fishermen at work. They do not only use trained cormorants for the hunt, but also lanterns to attract fish. These lanterns had ribs made of bamboo, which were covered with fine paper. He took the design of this traditional lanterns for the occasion to create light sculptures made of wood and paper on his own. For the 10A Floor Lamp, the designer uses paper of the mulberry tree, because it softens the light, making it gentle and spreads it evenly. ”The light of Akari is like the light of the sun filtered through the paper of shoji. The harshness of electricity is thus transformed through the magic of paper back to the light of our origin – the sun – so that its warmth may continue to fill our rooms at night” said Isamu Noguchi. The spherical shape of the luminaire body is perched on three feet in height and is made of painted steel, which ensures a certain lightness. Details made of wood and bamboo set additional accents, ensuring a harmonious mix of materials. With the soft light distribution and exceptional design, the Akari 10A Floor Lamp brings warmth, comfort and style in any living room. Single image of the Akari 10A Floor Lamp by Vitra. The lamp body consists of paper of the mulberry tree and spreads the light gently and evenly. The spherical shape of the luminaire body is perched on three feet in height and is made of painted steel, which ensures a certain lightness. Ambience image of the Akari 10A Floor Lamp by Vitra. Whether in the living room, bedroom or in the hallway - the lightweight design fits in any living room and provides warmth and comfort. Ambience image of the Akari 10A Floor Lamp by Vitra. With a height of 1230 cm, the lamp fits best on the floor, where it unfolds its full effect. Isamu Noguchi chose the name ‘akari’ that means ‘light’ in Japanese, connoting both illumination and physical lightness. 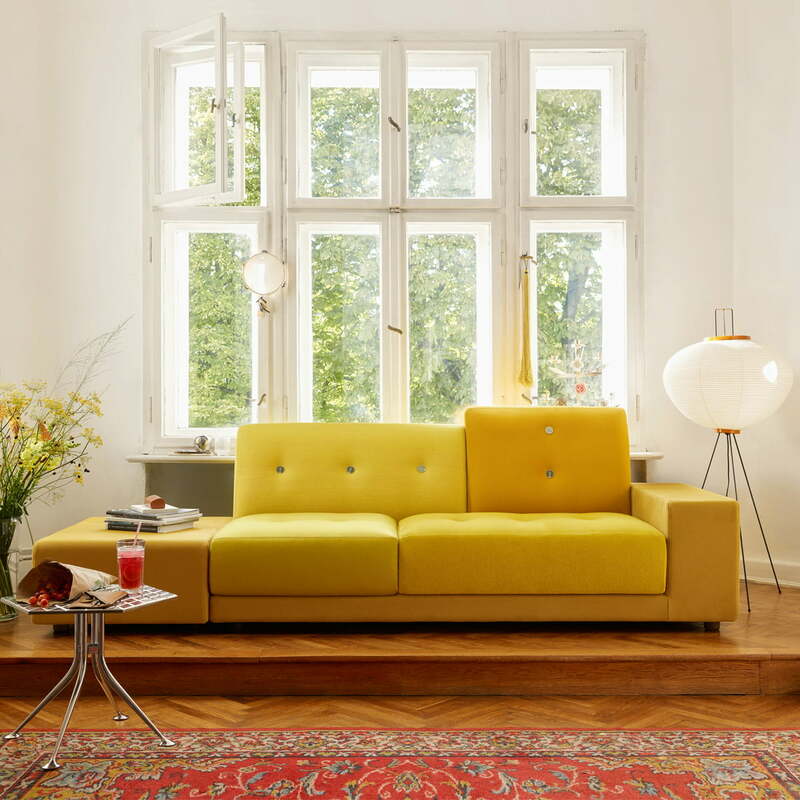 Harmonious Vitra design with the Polder Sofa XL and the Akari 10A Floor Lamp that ensures comfort and warmth to any living room. Design, functionality and comfort with Vitra products.